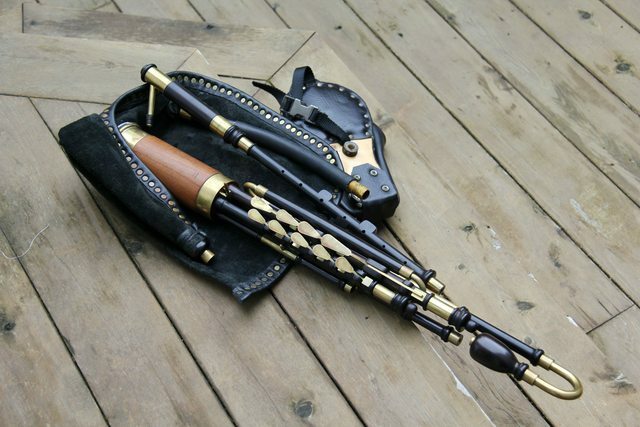 How do you get two pipers to play in tune?...Shoot one. Can you please share a soundclip or youtube of the new set ausdag? Thanks - that Gidgee wood gives the chanter sound a nice edge. I'd also like to hear how the tone would come across on a B or Bb chanter. I noticed that there hasn't been any recent Pic's uploaded recently so here's a Chanter I picked up over the weekend! - Maker Robbie Hughes. Good time to introduce myself, I suppose. My name is Carleton Hughes and the pics below are of two David Quinn full sets. These were recently given to me, along with a wainload of tools, parts, reedmaking supplies and a plethora of music by my Father-in-Law, Charles Mooney of New York. They are both concert D.
I suppose the fact that I play the Northumbrian smallpipes was a strong factor in his decision. being married to his daughter may have influenced him as well. The maple and Blackwood set bears the number 2088, while the Taylor style set was made in 1999. I recall when he brought them back from Vermont and played them for me.